A hyperbolic surface is a topological space such that every point has a neighborhood chart from the hyperbolic plane and such that the transition maps are isometries. A half-translation surface is a topological space such that all but finitely many points* have a neighborhood chart from the Euclidean plane and such that the transition maps are combinations of translations and flips. These finitely many points are called singularities. Precision note: according to Wikipedia, we need to add the adjective “Hausdorff” to our topological space. We won’t worry about this or give a precise definition of it; you can just know that Hausdorff has something to do with separating points in our space. Half-translation spaces come with something nifty that occurs in Euclidean space. You know how when you look at a piece of notebook paper, it has all these nice parallel lines on it for writing? Or if you look at a big stack of paper, each sheet makes a line which is parallel to the hundreds of others? This is from clip art panda. How useful! 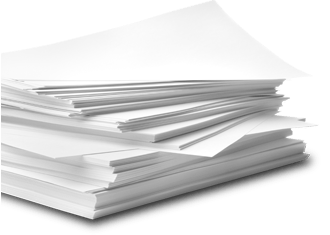 Mathematicians call that a foliation: each sheet of paper is called a leaf. This is an intuitive definition; we’re not going to go into a technical definition for foliation. Just know that Euclidean space comes with a foliation of all horizontal lines y=r, where r is some real number. Then since transition maps of half-translation spaces come from either straight translations or flips, the foliation carries over to the half-translation space (though orientation might have flipped, we don’t care about those in this application). Notice in the picture in the lower left that there are a few points where the horizontal foliation doesn’t quite work. Those are the singularities that show up in the definition of a half-translation surface (we need them if we want our surface to be anything besides an annulus). At those singular points, we glue together patches of Euclidean space. The orange color in this picture shows the path of the critical leaf as it winds all the way around the surface some number of times. We can actually get precise numbers instead of just signs for curvature. Here the triangle encompasses -π/3 curvature. Notice that it embeds straight down into the hyperbolic surface, so we see an actual triangle down in the lower left. If we made this triangle bigger and bigger, eventually it’d wrap around the surface and we wouldn’t see a triangle, just a bunch of lines hinting at a triangle up in the hyperbolic plane. That’s the next picture. Such a triangle in hyperbolic space has all three corners on the boundary/at infinity. This is called an ideal triangle. So all ideal triangles encompass -π curvature. You can see also how in the surface, we have a collection of lines whose preimage is the ideal triangle. We can also use the same process to find curvature in other places. For instance, if we make a little hexagon around a singularity of a half-translation surface, we can go around it with the same parallel transport process to figure out how much curvature the singularity contains. We’ll make use of that horizontal foliation we saw earlier. This looks very similar to our ideal triangle: the arrow starts off pointing up, and ends up pointing exactly the opposite direction. So this singularity has -π curvature too, just like the ideal triangles. Now for the math part! Here’s the question: given a hyperbolic surface, how can we construct an associated half-translation surface? Answer: we’ll use those foliations that we had before, as well as something called a geodesic lamination: this is when you take a closed subset of your surface, and give it a foliation. So it’s like a foliation, only there’ll be holes in your surface where you didn’t define how the pages stack. The first example of a geodesic lamination is a plain ol’ geodesic curve in your surface: the curve itself is a closed subset, and the foliation has exactly one leaf, the curve itself. After this example they get real funky. You don’t even have to take me to funkytown; geodesic laminations are already there! Given a book, we might want to know how many pages we’ve read once we stick our finger in somewhere. Luckily there are page numbers, so we can subtract the page number we started at from the page number we’re standing at. Similarly, given a foliation, we might want to have a measure on it, transverse to the leaves. If we have one, it’s called a measured foliation. These exist. So let’s start with our hyperbolic surface, and choose a maximal measured geodesic lamination on it. Maximal means that the holes are the smallest they could possibly be. Turns out this means they’re the images of ideal triangles under the atlas. Told you they were funky. Upstairs, we made a new purple foliation (transverse to the lamination) of the complementary ideal triangles, by using arcs of circles perpendicular to the boundary circle (these circles are called horocycles). So now we have teensier triangles in the middle of the ideal triangles, called orthic triangles. To make a half-translation surface, we’ll quotient out the horocycles, which means that in each ideal triangle, we identify an entire purple arc with one point. Quotienting out horocycles a.k.a. identifying the pink lines all as individual pink points. That means each side of the orthic triangle is identified with a point, so the orthic triangle disappears. In this way we get tripods from triangles. The middles of these tripods are singular points of the half-translation surface. The measure from the measured lamination gives a measure on the foliation of the half-translation surface. But Euclidean space actually comes with horizontal and vertical distances defined (remember, half-translation surfaces locally look like Euclidean space). So far we have a way to get one direction. How do we get the transverse distance? We use the fact that we chose a geodesic lamination of our hyperbolic surface. Geodesics are curves of shortest length; in particular they have length. So if I’m in my translation surface and moving along a leaf of the foliation, I can look back at where I was in the lamination of the hyperbolic surface and use that distance. [There’s some rug math here too.] So we’ve made neighborhoods in the half-translation surface look like Euclidean space. So that’s that! You can also go backwards from a half-translation surface to a hyperbolic surface by blowing up the singular points into ideal triangles. [More math, especially when the singularities of the half-translation surface are messy or share critical leaves]. 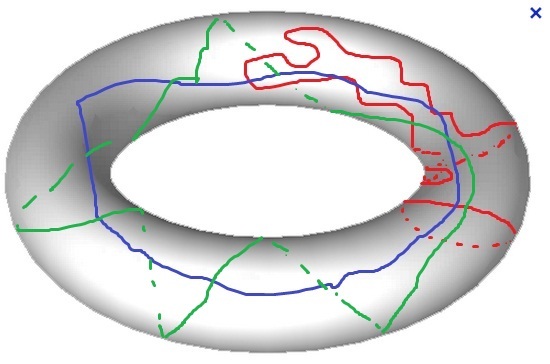 Aaron claims this is folklore, but a quick google search led me to this paper (in French) and this one by the same author who connects flat laminations (on half-translation surfaces) to the geodesic ones we see in hyperbolic surfaces in section 5. *I lied about finitely many points. You can have infinitely many singularities in a half-translation surface; they just have to be discrete (so you should be able to make a ball around each other disjoint from the others, even if the balls are different sizes). Examples of discrete sets: integers, . Examples of not-discrete sets: rational numbers, . I love talks that start with “I haven’t seen this written down explicitly anywhere, but…” because that means someone is about to explain some math folklore! There are some statements floating around in mathland that specialists in those fields believe, so the rest of us believe them because the specialists said so, but no one knows a citation or a written proof for them. That’s folklore. Two weeks ago I gave a talk and someone asked a question (are RAAGS uniquely determined by their defining graphs?) and I said “probably, but I have no references for you.” I found a reference a day later and emailed it to her, but the reference was way hard and had way more machinery than I was expecting. The power of folklore! Anyways, this series of posts will be based on a talk by a grad student at UT, Aaron Fenyes. This was a great, great talk with lots of pretty slides, which Aaron has generously allowed me to put up here. We’ll review curvature and surfaces, and then talk about how to go back and forth between two kinds of surfaces. 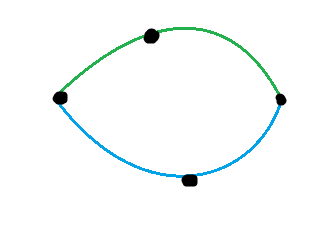 Left: tangent; line hits circle at exactly one point. Now walk toward the corner you’re facing, and then walk down the second side of the triangle still facing that direction (so you’re sidestepping), and walk around the next corner (so you’re now walking backwards) and keep going until you end up where you started. This is called parallel transport. If your triangle was in Euclidean space, then you’re facing the same way you were when you started. Gif! Note the ending blue vector is identical to the beginning purple vector. So we have curvature 0. If your triangle was slim, then you might find yourself facing the opposite way that you started! Or if your triangle isn’t that curved, you’ll find yourself facing a direction counterclockwise from your original one. Aaron Fenyes made the pictures; I gif’d it! My first gif! From the original to the new vector: it’s a pi/3 counter-clockwise turn. Similarly, if your triangle was fat, you’ll end up facing a direction clockwise from your original. The green arrow is now clockwise from the red arrow, which means this has positive curvature. So curvature is a way to measure how far clockwise you’ve turned after doing this parallel transport. Now if I take a little patch from my hyperbolic surface, I can trace back through one or two pairs of pants to find the original hexagon(s) in hyperbolic space where my patch came from. So I have a map from hyperbolic space to my patch of hyperbolic surface, describing the metric and geometry around that patch. This map is called a chart, and every point on a hyperbolic surface will have a chart associated with it, sending some part of hyperbolic space to a neighborhood of that point. Here Aaron picked a blue patch and an orange patch in the surface, and the picture shows their charts from the hyperbolic plane to the patches. There’s an isometry of the hyperbolic plane sending the orange patch to the new orange patch, so that the yellow parts overlap exactly. If we look only at the yellow patch, we can find another way to describe the map in the picture: first, do the blue chart sending the blue patch to the surface. Then, do the inverse of the orange chart, which sends the orange surface patch to its preimage. Restricted to the yellow overlap patch, this is the definition of a transition map. So here’s another way to think of hyperbolic surfaces, instead of gluing hexagons together like before. A hyperbolic surface is a topological space such that every point has a neighborhood chart from the hyperbolic plane and such that the transition maps are isometries. In this picture you can see the orange and blue patches on the surface which come from the Euclidean plane. Now we’re allowing translations and pi (180 degree) rotations only for our transition maps. That’s why they’re called half-translation surfaces: charts from the Euclidean plane, and transition maps are translations plus half-rotations (flips). As an aside, a translation surface is when we allow translations only, and no flips. In the next post in this series, I’ll go through Aaron’s explanation of how we can go from hyperbolic surfaces to half-translation surfaces and back, and we’ll get to revisit our old friend the curve complex. It’ll be fun! I just got back from the fantastic Graduate Student Topology & Geometry Conference, where I gave a talk and also brought my baby. I tried to google “bringing baby to academic conference” as I’ve seen one baby at a conference before (with his dad), and I knew this kid would be the only baby at ours. But it was cold enough/uncomfortable enough that I just had him stay in the hotel with my mom, and I ran back during breaks to feed him. Also, it was my first time being “heckled” by both of these two brother professors famous for “attacking” speakers- they happen to know just about everything and are also suckers for precision, which I am not (and should be). But I got a lot of good feedback on my talk, and I’m generally a very capable speaker (though I was not as prepared as I would’ve liked, thanks to somebody who likes to interrupt me every five minutes…) Anyways, this is not about me, this is about my friend who gave one of the best talks of the conference and more importantly, her research. This post is based on notes I took during her talk + skimming her paper (joint with her advisor) on which it is based. Remember that we had our introduction to hyperbolic space. This research is focused on hyperbolic surfaces, which are shapes that locally look like hyperbolic space- this means that if you look at one point on the surface and just a little area around it, you think you’re in hyperbolic space. A good analogy is our world- we live on a sphere, but locally it looks like flat space. If you didn’t know better, you’d think the earth is flat, based on your local data. So how can we build a hyperbolic surface? While hexagons in flat space always have angles that sum to 720 degrees, that’s not true in hyperbolic space. In fact, you can make right angled hexagons, which means that every single corner has 90 degrees. 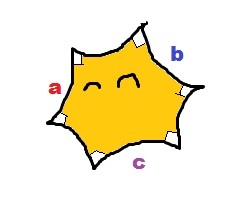 If you pick three lengths a,b,c>0 and assign these lengths to three sides of the hexagon like the picture, you’ll fully determine the hexagon- hyperbolic space is wacky! Now glue two copies of a hexagon together along those matching a,b,c sides. You’ll have a funny shape with three holes in it, and those holes will have circumference 2a, 2b, 2c. This is called a pair of pants in topology. You can glue together a bunch of pants to form a hyperbolic surface, by gluing them together along holes with the same length. Any hyperbolic surface, conversely, can be cut up into pairs of pants (this pants decomposition is not unique, as you can see below). You could also set one of those lengths equal to 0, so you’d get a right angled pentagon as one of the hexagon’s sides would collapse. You can still do the pants thing here by gluing together copies of the pentagon, but instead of having a hole with circumference 2a like we had before, you’ll have a cusp that goes off to infinity- it’s like an infinite cone with finite volume. Now we’ve built every hyperbolic surface (there are some more details, like how you glue together pants, but let’s just stick with this broad schematic for now). As long as the expression 2-2*(number of holes)-(number of cusps)<0, your surface is hyperbolic. So, for instance, a sphere isn’t hyperbolic, because it has no holes and no cusps, so you get 2 which is not smaller than 0. And a torus isn’t hyperbolic, because it only has one hole, so you get 2-1=1. But all the surfaces in the pictures in this post are hyperbolic- try the formula out yourself! One thing you can ask about a hyperbolic surface is: how long is its shortest essential curve? By “essential,” we mean that it isn’t homotopic (this is a link to a previous post defining homotopy) to a cusp or a point. This shortest curve is called the systole of the surface. Systolic geometry is a whole area of study, as a side note. But we’re interested in the question: how many systoles can a surface have? This is called the kissing number of the surface. So what Fanoni and Parlier do in their paper is come up with an upper bound on the kissing number of surfaces with cusps. I won’t go into that, but I will try to explain part of a lemma they use on the way. If your surface doesn’t have any cusps, then systoles can pairwise intersect at most once. But if you do have cusps, then Fanoni & Parlier prove that your systoles can intersect at most twice (and they build examples of surfaces with cusps that have systoles that pairwise intersect twice). This picture from the Fanoni-Parlier paper I did not make this! This matters because it implies that two systoles which intersect at least twice must intersect an even number of times. In particular, if two systoles intersect more than twice, then they intersect at least four times. If the green arc is more than half the length of the circle, then the blue one is less than half the length of the circle. So if you look at these short b-arcs, plus the a path, and wiggle things around, you’ll see a four-holed sphere (two holes “above” the a curve, and two holes “below,” one of each inside a b arc). 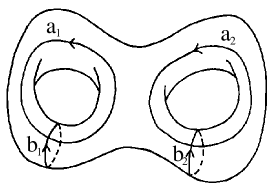 Left: a schematic of how a and b intersect. Black dots represent holes or cusps. This four-holed sphere has a curve on it, determined by part of a and the b arcs, which is shorter than the original systoles. This contradicts the definition of systole, so our premise must be wrong- two systoles can intersect at most twice. This was proposition 3.2 in their paper- tomorrow I’m going to share propositions 3.1-3.3 with my advisor’s small seminar. Hopefully I don’t get heckled too badly this time! OOPS I ALMOST FORGOT: life update. We bought a house and are moving to Austin, TX. I’m still planning on finishing my Ph.D., just virtually. [Up to a finite-index subgroup, obviously. Bad math joke]. I’ll probably be flying up to Chicago every so often to meet with my advisor/eventually defend my thesis. But yes, we’re driving in our minivan to Texas on Thursday. So… we’ll see when we get the internet set up in the new house. I’ll try not to make too long a break until my next post.